Wolf Patrol was on-sight for yet another coyote contest held near Mauston, Wisconsin at Jackson Clinic, a small tavern in Juneau County. Crew members patrolled the surrounding area beginning at sunrise on Friday, February 5 in order to establish areas where hunters may be looking for coyotes. The weather that weekend made ideal hunting conditions, with above freezing temperatures which led Wolf Patrol to believe their would be much hounding activity on the day of the contest. The roads were well-maintained, making navigation in and around the the Bass Hollow State Natural Area, fully accessible. Hound and coyote tracks were evident throughout the territory our monitors patrolled. 02/05/16: A snow covered road in Bass Hollow SNA. Saturday, February 6 Wolf Patrol’s presence was patrolling roads surrounding Jackson Clinic, the establishment sponsoring the event. By 730am, members were able to document the first two trucks equipped with hound boxes. Minutes later a string of trucks were parked along the same road. The rest of the day revealed heavy traffic, with at least 15 different trucks traveling throughout the beautiful bluff country in Juneau County. At times, men with rifles could be seen standing near the roads edge, and other times caravans of trucks would be seen driving throughout the open farm roads. By 1100am the first dead coyote could be spotted on top of a hound box. 02/06/16: A caravan of hound trucks with a dead coyote in the back. 02/06/16: A coyote being weighed-in at about 25 pounds. While waiting to see if any late arrivals would be submitted, Wolf Patrol crew members had the opportunity to speak to several residents and contest participants. The overall sentiment was that these hound hunters love to coyote hunt, and they love their dogs, even going so far as to say that they are the responsible hounders. Also, the consensus was that coyotes are a detriment to the local deer population. According to one gentlemen, “There’s nothing like the sound of my dogs running through the valley.” Later, bear hunting entered the conversation, and another hunter said “I don’t care if I kill another bear. I just like treeing them, and seeing what they’ll do, and letting them go.” Overall, the tone in this small bar was generally positive despite the actual killing of these beautiful predators, and the precarious position put on their dogs while pitted against a wild animal. 02/06/16: The two coyotes taken during the contest- 21 and 25 pounds. In conclusion, Wolf Patrol believes that encounters like these help us glean valuable information into the hound hunting lifestyle, and communities that participate in it. Despite disagreeing with the method by which this hunting occurs, and the general feeling of disregard for predators, our experience was a learning one; One that may help us make changes for the better for wolves and all of Wisconsin’s wildlife, by working with those that we oppose. 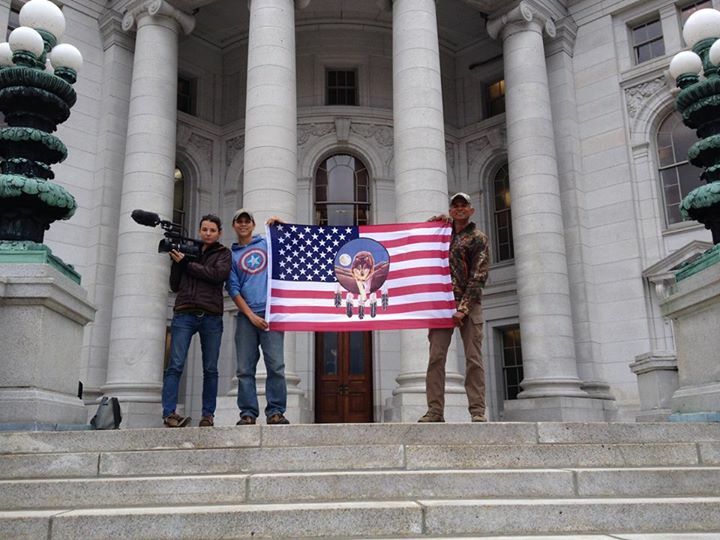 ‘Right to Hunt’ Act would criminalize first amendment rights in Wisconsin! 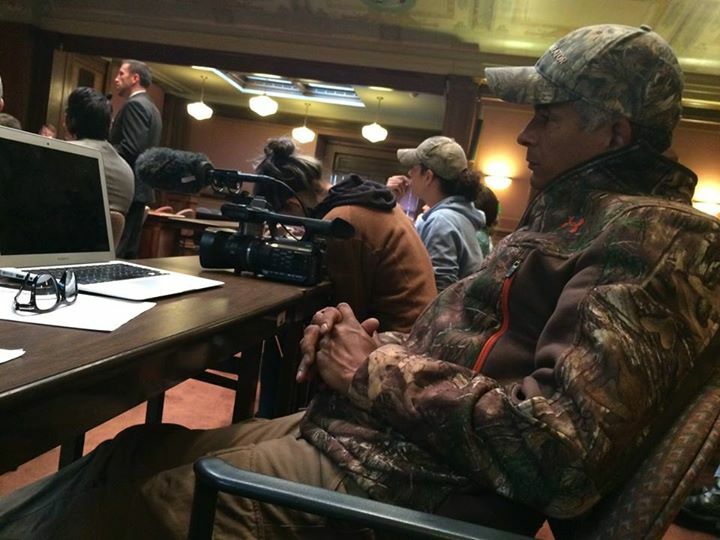 The proposed ‘Right to Hunt’ Act in Wisconsin would criminalize documenting hunting practices. The act was introduced by WI State Rep Jarchow in direct response to Wolf Patrol‘s work in national forests (public land) in WI. The text of the proposed Right to Hunt Act (SB338) in Wisconsin is available here: http://docs.legis.wisconsin.gov/2015/related/proposals/sb338. 10am at 400 Southeast for the Committee on Sporting Heritage, Mining, and Forestry public hearing http://docs.legis.wisconsin.gov/raw/cid/1205859. Our Wolf Patrol crew have simply been filming and documenting bear baiting & hound hunting practices on public lands to bring them to the attention of the public. These hunting practices frequently put hounds and wolves in conflict situations, with hounds dying and wolves being further demonized. Clearly we are having an impact if representatives with hunters interests at heart are trying to criminalize our activities. What are they trying to hide by stopping us documenting hunting practices? Wisconsin already has hunter harassment laws, and hunters have a lot of protections for their activities on public lands. 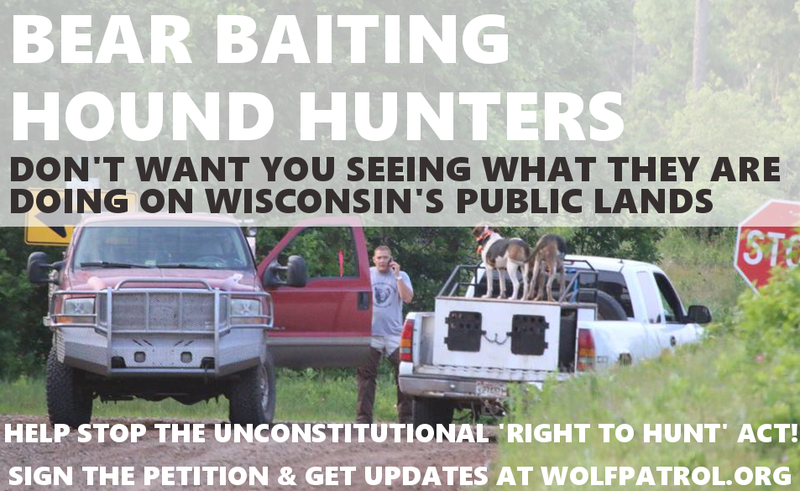 Please help us stop the ‘Right to Hunt’ act, which would inhibit the ability of ALL residents of Wisconsin to practice first amendment rights on public lands. In total, Wolf Patrol has documented over 37 bear baits within the four mile radius of the DNR’s Wolf Caution Area. What this reveals is that, bear hunters ignore the risks their hounds face when loosed in wolf territory. Probably because they know if a dog is killed, they will generously be compensated from Wisconsin’s Endangered Species Fund. So if you think that money you are giving to the state when you buy an endangered species license plate is helping wildlife, you are very wrong. Hound hunters receive up to $2,500.00 for each hound killed by a wolf in Wisconsin. Wolf Patrol’s Rod Coronado has long been a Miley Cyrus fan. So you can imagine our excitement when we heard the pop singer was taking a stand against senseless wolf killings! If any of her fans know of a way to get her to see this video, please share. Coronado made his plea to the singer while documenting illegal bear baiting operations in the Chequamegon-Nicolet National Forest, where bear hunters hounds are being killed by wolves who see the invading dogs as trespassers and threats to their families. If you would like to tell the US Forest Service that bear baiting in our national forests should be illegal, please send in your comments before September 30th.